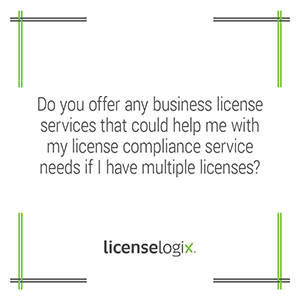 At LicenseLogix we understand the complexity of licensing, keeping track of renewals and maintaining corporate compliance with multiple jurisdictions. Because licensing can take up a lot of your time, we offer many Business License Services that can help to alleviate the stress and time you or your company spends juggling multiple licenses in multiple jurisdictions. License Compliance: LicenseLogix can manage your ongoing licensing and permit needs. Through our secure web-based Client License Information Center (CLiC), you can quickly access all your license information in one central location and be alerted to license renewals before they expire. CLiC also allows you to run reports, view application status and see all your renewal dates and associated fees. Should you not feel like handling your renewals just check a box to ask LicenseLogix to take care of everything for you. License Verification: Holding licenses across multiple states can be hard to keep track of and licenses that you thought you had in a jurisdiction might have expired without you knowing it. LicenseLogix offers a License Verification service, researching all your licenses, registrations and certifications to help you determine license numbers, expiration dates, renewals and more. License Research: If your company is expanding into new markets, it is important to make sure you are compliant on a state, county and city level. Our License Research service will compile a comprehensive research packet with all applications for licenses you need in your desired jurisdiction. License Filing: Once the necessary licenses have been identified, LicenseLogix can complete all license filings necessary in any jurisdiction. For more information on LicenseLogix business licensing services and how we can streamline business licensing for you, please contact us by clicking live chat, or you can submit a question, or simply call us at (800) 292-0909.